There once was a woman who was known around town as “the sinner”. I imagine that means she was a whore. Giving herself to any man in exchange for a buck or two. There were times, I wonder, if she wanted to do something else but didn’t because she’d been doing it for too long. It could be that over time she got comfortable with her title. Wore it like a badge of honor. But then Jesus comes along. We aren’t told how the woman knows Jesus, but it’s clear she had been greatly impacted by Him. So much so, that when she heard Jesus was at Simon the Pharisees house (also a badge worn with honor) she went to Him. She was unhindered by social cues or even common courtesies, but had an undaunted desire to give lavishly to Him. What does a sinner have to offer Jesus anyway? First, she offered Him her tears. Those tears held the shame from all those years and all those mistakes. Tears that she had held in for so long in order to not feel were now falling freely in order to wash His feet. As they fell, they seemed to purify her as well. The toxins of her past no longer bottled up inside. In those tears was hope and joy because that is what she found in Jesus. Her hair she used as a towel to dry His feet. This detail alone would have enraged those in attendance. Women were not allowed to have their hair down in front of anyone but their own husbands. Somehow in that moment she was not concerned about anyone’s eyes, but only those of Jesus. Her thoughts were focused on Him alone. And as she thought about Him she kissed His feet. Those beautiful feet which brought such good news to her weary soul. How could she not kiss them? Then, she took her jar of precious ointment and broke it. Not one drop of the contents would be saved, but all of it poured out on Jesus’ feet. The woman had taken her most costly possession and in an act of extreme adoration gave it up in worship to Jesus. Amazing how when beautiful things are broken they can bring a sweet smelling fragrance of adoration and love. As the woman showered Jesus with love, Simon thought to himself, “Hmphh, but she’s a sinner. Come on Jesus, you should know that.” He kept his disgust to himself as he watched her unapologetically love Jesus. Disgusted at the woman’s indecent behavior and Jesus for allowing it. Poor, stupid Simon got caught up in his critical and judgmental thinking. Quickly pointing at someone else’s sins while forgetting he had his own. But at least I’m not her. Stings a bit to hear. To hear how similar Simon can sound and to know that I’m often swept up in my own pious thinking. I mean, come on, I invited Jesus over for dinner. Give me some credit. When He came, because He’ll always come, I treated Him like a commoner. I say it’s because we’re just “that comfortable” with one another, but somehow dishonor veiled itself as familiarity. The intimate greetings we once exchanged have become the awkward side hugs between acquaintances or the cold distance between lovers sleeping back-to-back. What was it that caused the woman to have such a zealous love? The fact that she knew she was loved and forgiven. This is where my heart begins to ache, because I know it’s her realization of His love for her that causes her to act. Her expression of love was not meant to earn His love, but in response to His love. All the tears and all the kisses were in gratitude for what He had already given her. When you’ve seen a love like His you want to reciprocate and she did in the only way she knew how. God, I want a love like that…again. Not that I’ve ever lost His unconditional, unfading love, but I’ve forgotten how generous of a gift I had been given when I had been so undeserving. I, too, had been a whore freely giving myself to lesser loves. I had been the unclean woman. The sinner. Then, there He was and in an instant His love did for me what I could have never done for myself: forgive. I need a renewed revelation of that love. To stop trying to earn it or work for it, but to catch a glimpse of it in such a way that it brings me back to my knees in awe. And in that moment not care about the tears, or the stares, but to be consumed by it allowing myself to cover Him in kisses and pour out my most costly worship at His feet. My prayer for you is that you would catch a glimpse of the great love He has for you and that it would cause your heart to worship. If it’s not an old generation verse a new generation, then what is it? If it’s not the conservatives verse the “liberals”, then what is it? If it’s not denomination verse denomination, then what is it? The past few years have been a journey full of questions and wonderment that I hadn’t anticipated. I was seeing God in unexpected places and then not feeling Him in places that I thought I should. Up until then, I had been satisfied with the pretty picket fences I had built around my box-shaped house where I kept God. In there, He was safe, secure and controlled. If I do this, then God does that. Ignorantly, I participated in this manipulative game thinking I could force God’s hand if I just did all the right things. There I knew what to expect out of Him and that was a comforting feeling. It looked like faith and even felt like faith. He’s wild and that scares the hell out of me. Like the wind, I can’t anticipate where He’s coming from and I only know where He’s been because I’ve seen the effects of Him having been there. It seems like the only way to survive it…or Him rather…is to just go with it. But “going with the flow” leaves so many unanswered questions. Yes, questions. My many, many questions. Questions that most of the time I’m afraid to admit to myself, let alone anyone else, because it seems “wrong” to question God. Not that I think God is insecure, that’s laughable, but because Christians can be when it comes to Him. Yet, there in my head and in my heart the questions beg me to wrestle and some days it feels like they’ve got me pinned. Each day, I keep wrestling. In the wrestling, some traditions (or traditional thought) that once seemed non-negotiable, now seem less important. These traditions have become, without me knowing it, idols in my life and God has begun dismantling them. My eyes have been set on them instead of Jesus, so as they fall and crumble, I have this feeling like my world is falling and crumbling around me. Like the words from this old chorus* I begin to realize: “all the things I once held dear, built my life upon, all this world reveres and wants to own, all I once thought gain, I have counted loss, spent and worthless now, compared to this…knowing You Jesus.” For some of us, Christianity has been our world system and our pet beliefs have been our badge of honor and the things we fight for. Sadly, knowing and pursuing Jesus has taken some lesser priority or forgotten all together. Our beliefs about Jesus should never overshadow simply knowing Him. 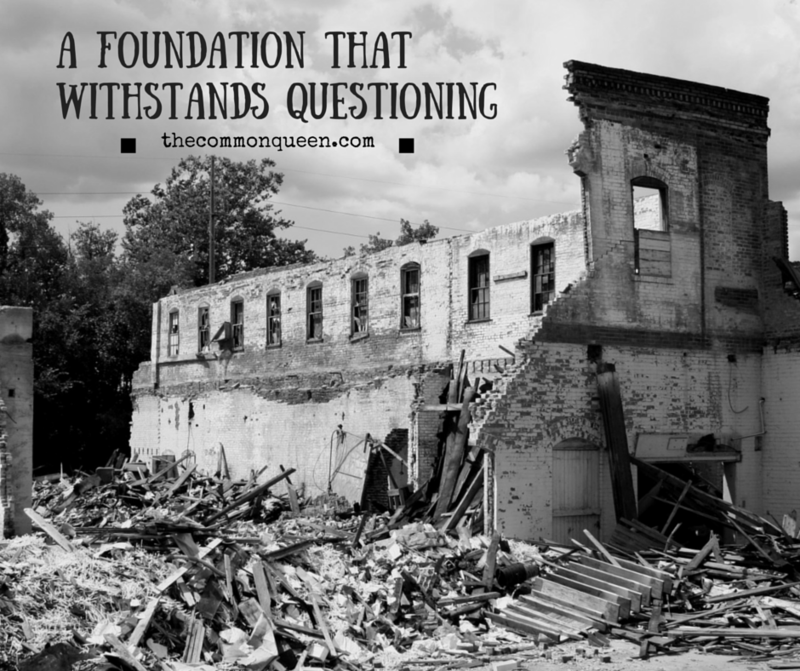 So, white picket fences and boxes meant to contain God may be leveled to the ground, but my Foundation remains. Jesus remains. There will be a rebuilding that takes place, but it will never look like it did before. Actually, I’m not sure what it will look like. I’m just going to continue pursuing Jesus knowing He’ll take care of me in the process. Remember, there is only one foundation, the one already laid: Jesus Christ. She shuffled to the front of the sanctuary with a sense of determination in her gaze even though it was clear she carried a heavy burden. Each step forward bringing her closer to unloading her weights and closer to the freedom she desired. Everyone sat in hushed silence patiently waiting for her to reach the summit. As she turned toward the congregation, we noticed her eyes were brimming with tears. And in her words was a confession. Before a crowd of friends and strangers she rent her heart open exposing an area where she needed help. 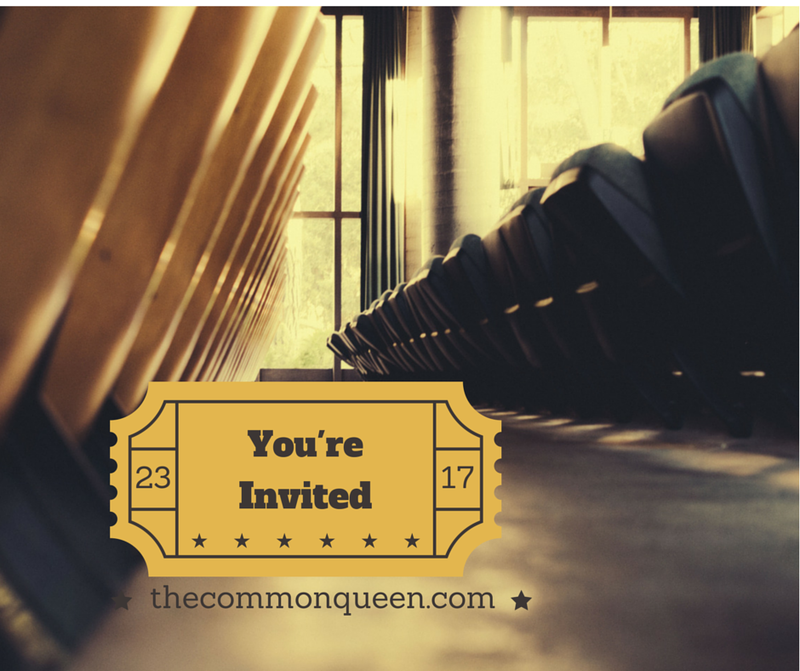 I sat silently in shock– not because of the nature of her confession. The confession itself was something that most, if not all, of us could confess at one time or another. 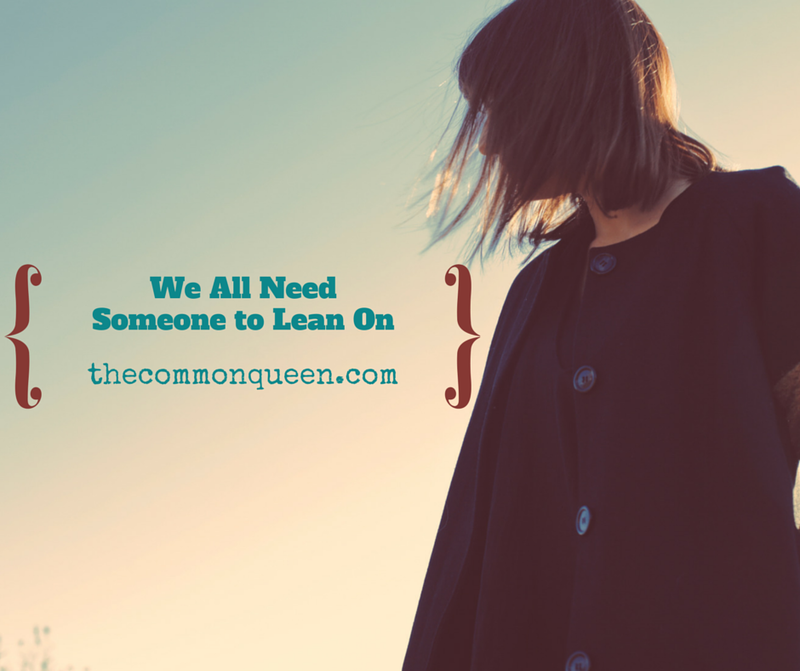 What caught me was her courage to admit she needed help. She had no shame in her voice as she stood bare before us. Just a simple boldness. As she spoke, people began to gather around her and I saw first hand what community was meant to look like and it was beautiful. I’d been longing to see community in action. Not just in service projects, either. I think we sometimes confuse service with community. Community is much more than that. Does it involve that? Many times it does, but you can serve a stranger and never get to know them. Never know their story, their heart, their struggles. It’s about really listening. And not the type of listening that is more focused on formulating a response. We can get so caught up in wanting to “fix” someone or bring them comfort that we forget that sometimes the best thing we can do is just hear them out. Stop trying to solve problems and just listen. No need to search for the perfect cliche or some other over used nugget of wisdom. Just let them to share. There’s this Asian restaurant in my town that I’ve been wanting to try so I invited a friend along so we could experience something new together. Any time you add food and friends you’ve got a recipe for an enjoyable evening. The Pad Thai and spring rolls were pretty great, too. As we ate, we talked and I shared with her how I’ve thinking about the purpose of church (a post about this coming soon) and how I think community is or should be involved. It’s a topic I struggle with regularly and I’ve been wanting people’s insights and wisdom on the matter. She mentioned how we can’t just surround ourselves with others our own age or position in life. I believe community needs to be diverse. No one grows when they surround themselves with people just like them. We need to hear stories from our older, wiser, more experienced community members because they’ve got a wealth of knowledge. Knowledge gained through years and lessons learned. We need to listen and learn from our teens who may not have years behind them, but can certainly have insights that we can glean truth from. There’s this older couple I know. They’re both nearing the 90-year mark and within the past few years, I’ve made it a point to connect with them because they’ve been through 90 years worth of stuff. That’s an entire 60 more years worth of stuff than I’ve been through and they still love and follow Jesus. I’ve got a lot to learn from them. On the other hand, I know this 14 year old girl. Actually, she’s my oldest niece. I wouldn’t say she’s your typical teenage girl by any means, but there are days I remind her that if I catch her talking to a boy that I won’t be afraid to kill him. She rolls her eyes at me when I say that– she has picked up some of my sass. I also see her amazing capacity for compassion, too. I’ve got a lot to learn from her. The beautiful thing about community is that everyone is valuable and everyone is needed. No one should be excluded or looked down upon. No one should be called obsolete. Or insignificant. We need community. We NEED it. And I’m grateful that I get to experience it–whether in the four walls of a church or in the corner of a quaint Asian restaurant. It is there within community that we can heal and mature…and be refined through relationships. 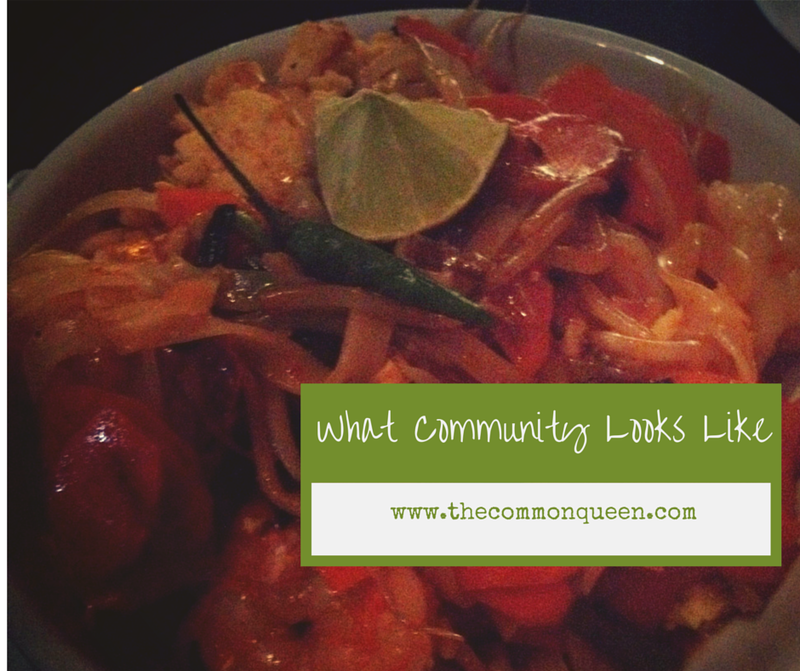 Leave a comment and let me know how you’ve seen community in action. Don’t get me wrong, those are important questions. Beards, coffee and chocolate are ranked pretty high on my list. In the scheme of things though, if they went unanswered my life would continue on much like it does. No matter the reason, I’ll always love beards. Even if Starbucks doesn’t take my suggestion and start delivering, I’ll still stop in and buy my White Mocha in person. And chocolate, well, chocolate seems to be around for the long haul. Some questions are a bit more serious. Like my questions about God, spirituality, faith, church, death and (ya even) singleness. I can’t just sweep these questions under the rug and ignore them. They need to be expressed, discussed and studied…in a safe environment. Not everyone understands the questions you’re milling over. There will be people, upon hearing your questions, who will immediately get defensive. They’ll rattle off answers left and right making you feel like an idiot for even verbalizing such a foolish question. Have you ever met someone like that? If you have, and I’m sure you have, did you ever want to ask questions around them ever again? Probably not. Sitting around a table last night with some friends, we began discussing things we’ve been wrestling with in regards to our faith. Each person shared what was on their heart and no one judged them for it. And I realized, love listens. Listening to a podcast this week, the theologian was discussing how we can go through phases in our life where it seems like we have more questions than we’ve got answers. Either we’ve read a book, taken a class, gone on a trip or experienced some kind of life event but something has caused us to re-evaluate our beliefs. Whatever the case, most of us will go through it to one extent or the other. As I’ve been wrestling and questioning and searching I’ve often felt very alone. I often kept my questions to myself and wondered what was wrong with me. Questions were bad, right? It was a sign of backsliding or a mark of the beast or something. I’m not sure anyone outright told me my questions were bad, but it was usually implied by the contortions of their face or the way their head tilted to the one side with raised eyebrows that indicated that maybe I’d better just keep those things to myself. Hearing that my searching and questions were normal brought me immediate peace. My shoulders immediately relaxed and it was as if the ground stabilized again. God is not troubled by my questions. He is not insecure or defensive or even worried. Not in the least. In fact God is pleased I want to know more because it shows I’m interested in participating and not satisfied in spectating. In my looking, I may have unanswered questions, but I know I will find Him because that is where the compass of my heart is set. 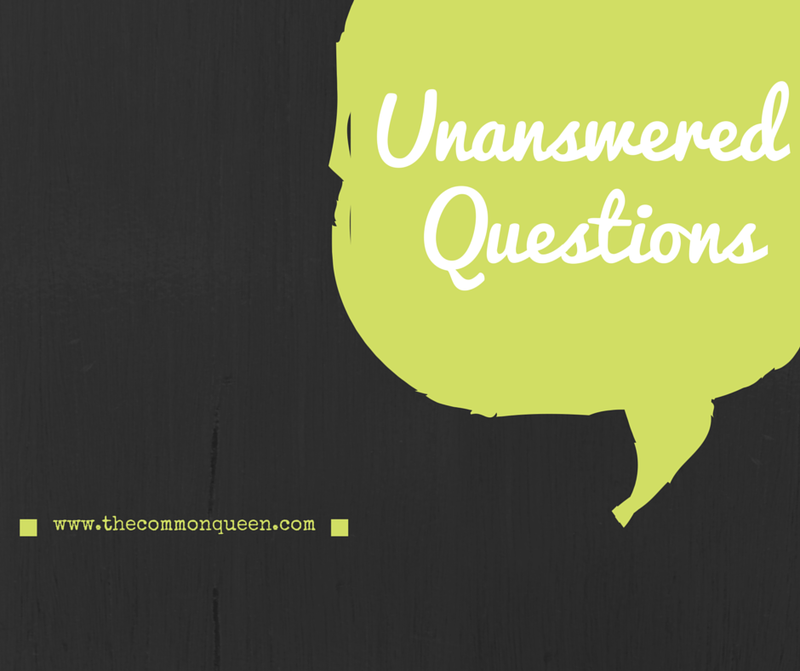 Do you have unanswered questions? If so, lease leave me a comment and let me know how your search is going. I’d love to encourage you or pray for you on your journey! It’s just that it seems a lot like a meeting to get through. Granted, a meeting that starts with a song, or rather, a half a dozen or so. For some the songs come out of hymnals with an organ accompaniment while others use songs written in this decade. I’m not picking on either one, I enjoy both. The point is every service starts the same way. Next, there’s the offering/ announcement/ hug your neighbor time. When visiting a church, this is my least favorite time. I’m not a fan of hugging strangers. That could be because I’m all of 5 feet tall and hugging anyone means my face automatically goes in their arm pit, shoulder or chest. Here’s the deal, people. If you’ll bend down a few inches I’ll stand on my tippy toes. Ok? Luckily, we live in an age with smart phones, so this is also a great opportunity to look busy on your phone. I think there’s added points if you update your Facebook status with a Scripture or some lyrics from a song sung that morning. (I get it. I’ve done it, too) Extra, EXTRA points if you use #blessed in the description. The capstone of your morning is listening to a sermon. It’s a trail mix blend of stories, Scripture and pithy truths to scribble down in a notebook or on the back of a bulletin (and most likely) never read again. Heck, by mid-week I’m not even sure I remember the verses that were referenced. That might be because, periodically, throughout the message I’ll find my mind wandering to the weather outside, the fact that my leggings are cutting off my circulation or the laundry list of tasks I need to accomplish the coming week. I’ve been to numerous churches in my lifetime and the general outline is the same. Come, sing, give money, hug people, listen to sermon and go. Ya sit, stand, sit and you’re out of there by lunch. You can almost taste the Chinese buffet now. Mmmm….Sweet and Sour Chicken. I’m not saying any of this stuff is wrong. It’s good to worship. It’s good to give. It’s good to hug (sometimes). It’s good to be taught. I just think we’re missing the point. I think about Heaven a lot. Maybe it’s because life is so freakin’ hard or maybe it’s just because I’m homesick (Heb. 13:14). Its been said, “Don’t be so Heavenly minded that you’re of no earthly good.” That’s a bunch of bologna. If anything, we need to be more Heavenly minded. What would that look like? I’m not exactly sure, but sure isn’t some mandated meeting. It’d be more like a party. There’d be laughing and food and celebration. No one nods off at a party. No one checks their watch at a party. No one is worrying about work the next day at a party. I love inviting friends to parties. Meetings…not so much. This isn’t some lame-o excuse for me not inviting my friends to church, then again, maybe it is. The last thing I want to do is bring a friend to church and have them leave thinking, “If that’s Christianity, it sure is boring. I’d rather stay home and watch football.” I think they call that doing more harm than good. Truth be told, I’d rather stay home most Sundays, too. But, if I can invite my friends to a party, that’s a different story. I’m not talking about flashy lights and fog machines, either. Our modern day church services seem to place a much smaller value on relationships and community and a lot more value on me facing a podium or a stage or a screen. Before anyone loses their mind, or thinks I’ve lost mine, let me be clear– I’m not anti-church. It’s great to gather together with a common focus (Jesus) and sing songs to Him and learn about Him and build relationships with one another. I just don’t think what we’ve always done is working. It looks an awful lot like a four-walled box. You come in, you do your time, and you go. That sounds awful because it is awful. I want something more and I think the world is looking for more. Something significant. Something worth getting out of bed for…and not just because there’s shame propelling you through the church doors. In the end, I want a slice of Heaven on Earth. Not just on Sundays, but every day of the week and I want people (all people) to see that and want it too. There’s a word that’s been on my heart since just before the start of the new year: lean. It’s kinda random. I get that. Yet, the idea behind it (as I am going to share with you) is my theme for 2015. I have not perfected this concept, but it is something that I feel compelled to pursue in this coming year. Let me explain. I worry a lot. The kind of worry that wakes me up in the middle of the night wracked with anxiety and fear. My mind will flip flop between cares as my heart races pounding at the walls of my chest. For hours, I’ll lay there praying (begging) God for relief until I fall back to sleep in mid prayer. I’ll reawaken the next morning feeling like I’ve made it through a war. I layer make-up on top of the bags under my eyes in hopes to conceal the previous night’s battle. The morning is spent fueling up on caffeine so I can power through my day. The day is not much better than the night. More worries. More anxiety. I busy myself as much as I can to distract my thoughts. I’ve found myself longing for peace– some relief from the constant barrage of uneasiness. Something to steady the waves and bring some calm. I’ve tried calming my own storms. 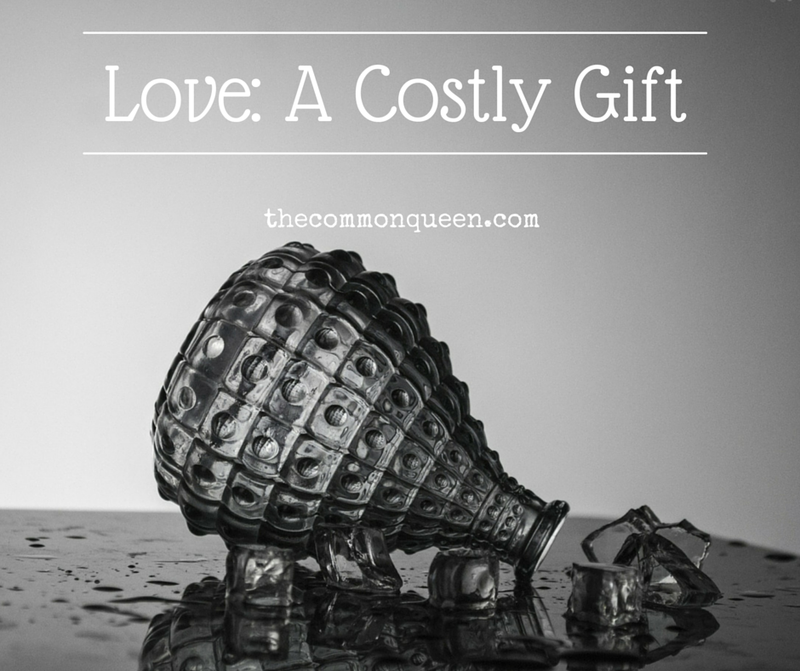 It only made things worse– the more I strived the more I felt like I was drowning. I couldn’t live like that anymore. There’s no way I’d spend another year, another month, another day, another second like that. Something needed to give. In my sigh laden prayers, God told me to just lean. Leaning means no more striving. It means no more busying of oneself. It means rest. I want to be like the disciple John and just lean on the chest of Jesus. To hear His heart beat. To be that close to Him. I can’t allow these worries, anxieties and fears to be plaguing me any longer. So, I’ve started being more intentional. The moment worry comes in I begin to lean. I’m not saying this is THE magic formula for anxiety, but I can tell you that it is causing me to be deliberate about shifting my focus from my worry to my Prince of Peace. As I thought about this post, I was reminded of Elisha Hoffman’s hymn that proclaims, “Leaning, leaning, safe and secure from all alarms; Leaning, leaning, leaning on the everlasting arms.” His arms are strong enough to carry all our burdens and shelter us from the storm. He doesn’t need our help, but takes great joy in caring for us. It’s easy to get caught up in the downward spiral of thoughts and endless “what if’s”. If you find yourself feeling overwhelmed or anxious or fearful take a moment to stop and turn to Jesus. It may sound silly or too simple, but give Him a shot. You may just find some peace and comfort in the fact that He can handle it. All of it. I’m not perfect. I doubt that’s a shocking revelation for you to hear, especially if you know me at all. I love Jesus, a lot, but I mess up. Actually, I don’t think there’s a day that goes by where I think to myself, “Way to go! You did great today!” Most times, I’ll be in bed at night replaying events from the day where I fell short. I’ll remember an attitude I had with someone. Or the way I yelled at the idiot on the highway for not merging fast enough. Or for calling the person on the highway who didn’t merge fast enough an idiot. And those things just compose the things I did wrong before 10AM. I’m not here to showcase my long list of failures. I could, but that’s not the point. The point is that it happens AND I’m not alone. Ya, I’m looking at you. Maybe you don’t suffer from acute road rage or give anyone attitude, but I’m sure there are things you struggle with. Maybe you judged that girl in the grocery store for wearing leggings as pants. Or you lied and told your kid there is a Santa Claus (sorry, kids). Or you stole wifi from your neighbor. We can all be more relaxed now that we admitted that we fall (or have fallen) at times. As a Christian, that is SUPER encouraging. YES. It is super encouraging for me to know that I’m not the only one who falls down. That’s what stopped me in my tracks today when I heard Proverbs 24:16, even when I’ve heard this same verse 100 times before. There was this beautiful realization that godly people, righteous people, lovers of Jesus….FALL DOWN. There doesn’t need to be any shame in admitting that fact because I am not alone. I’m not celebrating my imperfections, but I’m also not letting the realization that I have them keep me bound. There’s freedom in confession. That’s not the whole story, though. There’s even better news. I can get up. As a child of God, I have the power to get up. Circumstances, difficulties and hardships will come my way, and they may even trip me up, but they won’t keep me down. 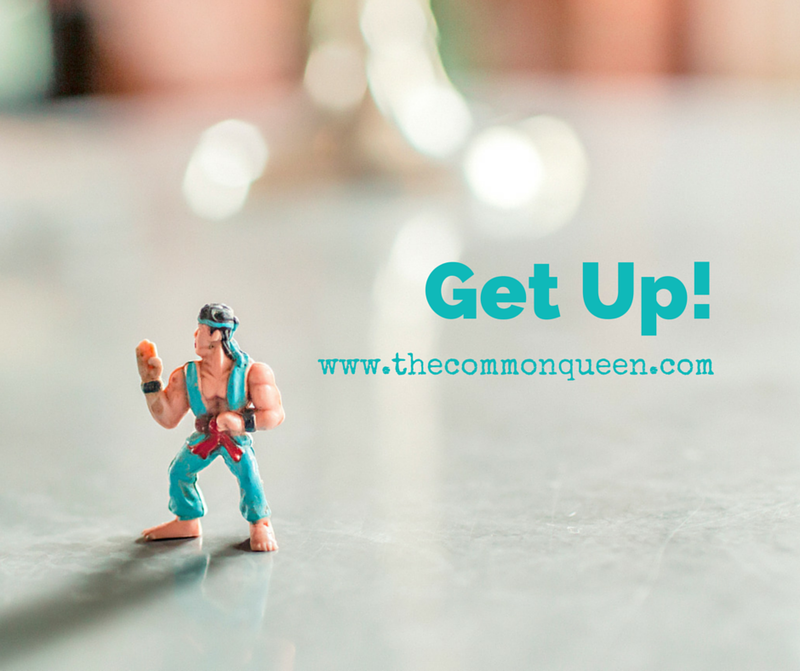 Life….or our own stupid actions…can hit us hard, but the important part is that we get up. If you’re struggling, get up. You aren’t powerless, but have the most powerful Source within you. Don’t stay on the ground wallowing and complaining about how defeated you feel, but allow the power of God (the strength of God) to move through you and pick you up. Dust yourself off and keep going.